Console tables are usually slender, long tables that people place in their entryway or hallway. They are versatile pieces of furniture that can be placed nearly anywhere in a home, but they are often thought of as only entryway or hallway furniture. With the right table and the correct placement, a console table can be used in a variety of ways and can add a lovely stylistic accent to any space. Read on for more! 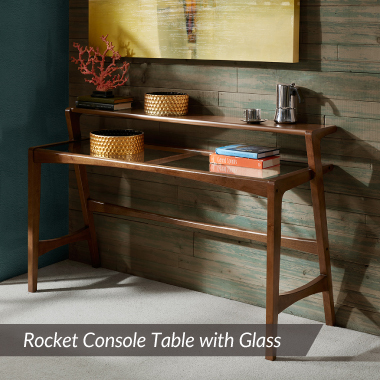 The classic application for a console table is in the foyer or hallway of a home. Situated this way, a console table is an important piece of furniture as it is the first piece seen or used when entering a house. It can be thought of as the ‘opening statement’ of your home. 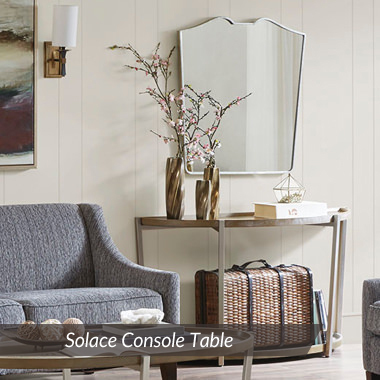 You will often find console tables coupled with mirrors, which add light, functionality, and sophistication. Replace the mirror with wall art, and the console table functions to visually ground the piece. It also draws attention to the art piece because individuals will naturally have it at eye level whenever placing something on the console table. 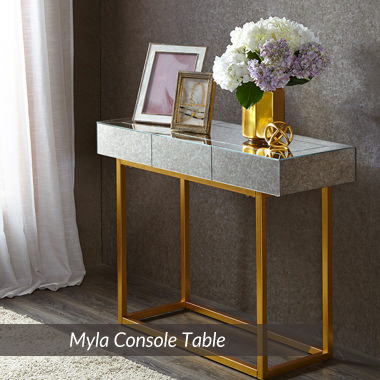 Functionally, console tables work well in hallways and entryways because they provide surface area and organization without obstructing the walkway. If you are wondering how to style a console table, try baskets or trays placed on its surface that can hold keys, wallets, and other items you want to load or unload from your pockets as you enter and exit the house. The space under the console table provides an out-of-the-way area to store things like backpacks or shoes. Many hallway (or entryway) console tables are coupled with a shoe rack which fits underneath. Another application for a console table is in the dining room. Oftentimes, you will find one placed near a dining table to provide extra tabletop surface area for items which do not need to be on the main table. Entertaining guests? Use the console table as a temporary bar. If you are shopping for a console table to put in your dining room, consider one that has drawers where you can store cutlery, napkins, and placemats. Living room applications for console tables are varied. Try using one as an extended side table, or place it against the wall to accent the room and create an out-of-the-way surface to toss random items - which can help to de-clutter the coffee table. Console tables love lamps, and lamps love console tables, so consider placing one or even two symmetrically on the surface. As always with living room furniture, find one that matches the existing decor of the room. 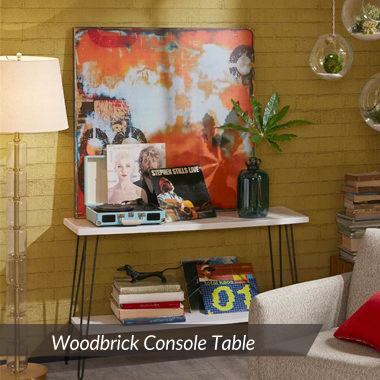 In addition to an accent table or side piece, console tables can be used to function as TV stands, or media consoles. Their narrow body and raised surface make them ideal for some living rooms. It is recommended to find one with shelves and drawers so you have a place for the array of your living room items, including your cable box, DVR equipment, and media. Learn more tips about living room organization hacks in our related article. Remember when we were discussing placing a mirror above your hallway console table? Employ this application in the bedroom and add an accent chair or stool, and you have a custom bedroom vanity. Adding a table lamp off to the side and stocking the surface with your jewelry and perfume creates a piece that is both functional and beautiful. In addition to a stylish and unique vanity, storage console tables can sometimes work well as nightstands. With increased surface area, you have plenty of space for your books and reading lamp. The negative space underneath the table is perfect for bins or other decorative storage where you can keep linens and personal items. Next time a friend asks “what is a console table used for?” you can share with them the variety of potential applications. Console tables are versatile pieces; when the proper style is purchased, they can add class and functionality to any space.